I came in 35th. I was a bit disappointed that I didn't go home with the Space Marine Battalion box and the nifty last place trophy. I forgot the fact that my Bloodthirster has eternal hatred, that my newly added herald has daemonic robes, and I had a random Chaos horsemen in one of my blocks of flesh hounds due to a missing model. Between that, bad dice rolls, and some really bad strategy against dark elves... I got my a** handed to me. It was a blast. An exhausting, sleep deprived fun weekend filled with geekery and a bit of drinking. I managed to get my army up to three colors in time thanks to JWolf's loan of supplies. I sat on my bed between my snoring [but great] roommates and painted details till 3am on Saturday morning. You could definitely see my army from across the room. I hope to complete them entirely in the next couple of months - work and class permitting. My opponents were courteous about my math issues and understanding in my tournament newbishness. I didn't sit across the table from an overly competitive, poor loser/winner once. I was really glad to be paired up with some great people. Day one: My hands were shaking before the first parings were announced. My nerves were not a good tell as to how the day would go. 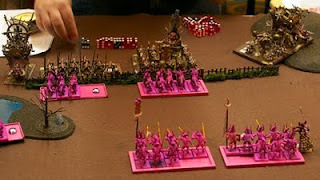 I played a magic heavy lizardmen army first round. My daemons on as long as they could, but ended up being tabled in turn 6 after being led into some traps by a bunch of skinks. Round two paired me up against Ryan Smith's beautiful Avatar themed Wood Elf army - the best appearance award was well deserved. He was a joy to play against, too. The battle ended with a 4 point difference, so we agreed on a tie. My third game was a pairing two women [myself and Arica] playing in their first tournament. We made it to turn four before time ran out. Her dark elves were brutal, well painted [hopefully I can convince her to write an article on them soon], and destroyed my force. Best sense of humor ever, by the way. If you have a chance to play this lady, do not hesitate. My final game of the day was against a tough Vampire Counts list - lots of ghouls and a rank of vamps in one big block. We made it to turn six - I lost in the points count up. Day Two: Started my day [too early, and without camera] against the same VC army I'd finished day one with, with similar [but slightly better] results. Round two was against another Lizardmen army - he had me running from two Stegadons at the end of the game. My final round was a battle against Tomb Kings on the last table - the magic in his list balanced out the stabby of mine. It was probably the most evenly matched, strategically fun game all weekend. Yeah... we didn't play in the full tournament, we didn't get to validate our gaming acumen against the best assembly of competition in a great long time. What we did do, however, is have fun from start to finish. There were three Tracks this year. Personally, I played on the Siege of Vracks as Ork Mercenaries. Played the whole weekend with the same 5 other guys, and had a flat out blast. • I got to play with Dave Taylor the whole weekend and pick his brain on gaming in general, not just how to make models look more awesome. • I got to play and really get to know 5 guys from all over the country; by Saturday night we were trading rounds of beer the whole time. • I got to bring out all of my models that I don't normally get to play. I got a Mega Dredd for Christmas last year and I own 2 Stompas... if not for a giant Apoc. Game I wouldn't get to play with them. • BigRed runs the game with an Iron Fist. I can't emphasize enough why this helps the Apoc. Game run so smoothly. Everyone has to keep moving and running... you don't get lost waiting for one end of the table to finish some random shooting phase... turns are timed and the pace is brisk. He also worked very hard to push for people to do the more epic and fun thing as opposed to the lame boring thing. •You have an entire table of people rooting for things to blow up. My Big Mek Stompa got the kill shot on two Reaver Titans. The first one was AMAZING: 20" Apocolyptic explosion that left a giant hole on the Imperial side of the table. It was AWESOME. Sunday, the kill shot only resulted in a wreck. All involved, once the kill was assured, let out a chorus of "Lame." It's like Mythbusters... it turns out to less fun when we don't get the Big BOOM. People bring the pretty and created some truly epic battle shots. I know there were some really cool armies in the big 40k tourney, but there's something to be said about seeing 18,000 points of painted Forge World or completely scratch built models on the table. BigRed will have Pic of the Day archives from all three tables for months. So really, the reason to play the narrative is that the focus is a weekend spent having a great time. We got prizes same as everyone else. We got to show off skill at the game, same as in each of the tournaments. We had reason to model some really cool stuff and show it off. I got compliments on my Trash Can Ork army and I held a big smile all day, validated for all the hard work I put in to get the army ready. Oh... and we got to sleep in. The Narrative doesn't start until 9:30 each morning. So to sum up... EPIC moments, prizes, really cool models, and we get to sleep in. I'm hooked and will be playing the Narrative from here on out." All of the folks I talked to mentioned the fun they were having last weekend - even if they were getting beat into a pulp. The opportunity to play new opponents was great, as was the ability to get to know them after the games were done. If you haven't had the chance to go to a big event like this, I have two words: do it. You may not win a game, but you'll have plenty of fun. 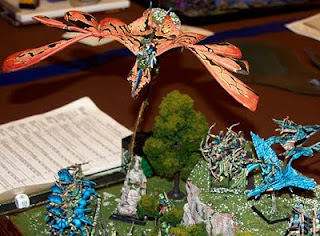 I know a lot of you played in the 40k event and the other events hosted at the con... what did you enjoy most? Why would you reccomend participating in a large con to someone new to the game?